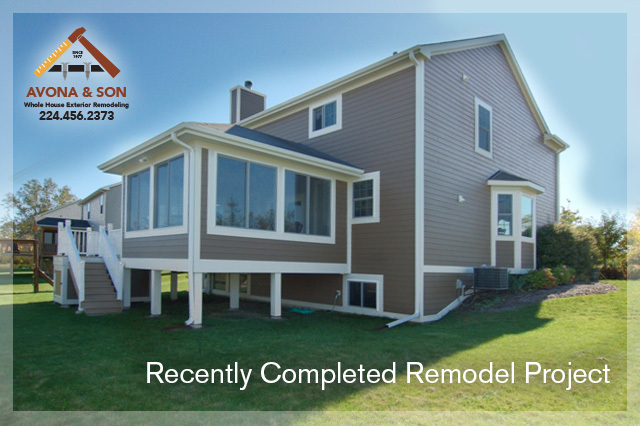 With thousands of completed projects and counting, Avona is the most detailed and trusted exterior remodeling company in Northshore area. Why Choose Avona & Son for Your Next Repair or Remodel Project? Avona and Son is a family owned and operated business that has successfully served the entire North Shore and Chicago land area since 1977. Throughout our many years of service we have obtained a reputation for high quality craftsmanship, pride and passion for our work, and long lasting relationships. Communication: We will listen to your goals, needs and wants. From there we will devise a plan that hopefully exceeds your expectations. Details: The smallest details on-site are given full attention. Reliability: We keep our promises. Ease of Doing Business: We take control of the project needs. All aspects of the job are explained, from installation methods to products being used. Cost Effective: We make sure we’re always efficient, economical and competitive with our pricing. I have used Avona & Sons for years. They replaced my roof and windows on my previous house, and when I needed to put gutters on my barn, I interviewed five gutter companies. Avona & Sons were the most knowledgeable and honest people, so I chose them again. I just put a new roof on my current home. They did it lightning fast and used the correct materials. They have also worked on my investment properties and many of my client’s homes. We try to support the community and family businesses, and Fernando and his father have decades of knowledge and experience. They provide excellent service and stand by their work. That is very important to me, and I highly recommend them to everyone.